Lightweight, low-profile reels designed for hose lengths up to 500 ft. Primarily 304 SST construction, including discs, axle hub and welded frame. Non-SST components: Drum (Aluminum), Swivel Joint, Bearings (Plated). Manual (direct crank) reels include both pin lock and 3-position cam-lock drag brake. Electric rewind reels (denoted by letter ‘E’ at end of model) feature plated chain/sprocket drive with guard. Standard inlet: 90° full-flow swivel, 1/2" FNPT threads. Standard outlet: 1/2" FNPT threads. Standard pressure rated to 3000 psi (207) bar. Higher pressures available, consult factory. Optional aluminum stackable frame available (for manual rewind reels). Optional SST rollers and roller mounting brackets. Drum, swivel joint and bearings all upgradeable to SST, specify when ordering. Power rewind reels: Motor available in 12 or 24VDC, as well as 115VAC. Model on left in image above shows manual reel with optional rollers, standard electric rewind shown on right. No results available based on the combination of filters chosen above. Please choose a different combination of Reel Capacity/Rewind Option to show more results. Other models available than those shown. 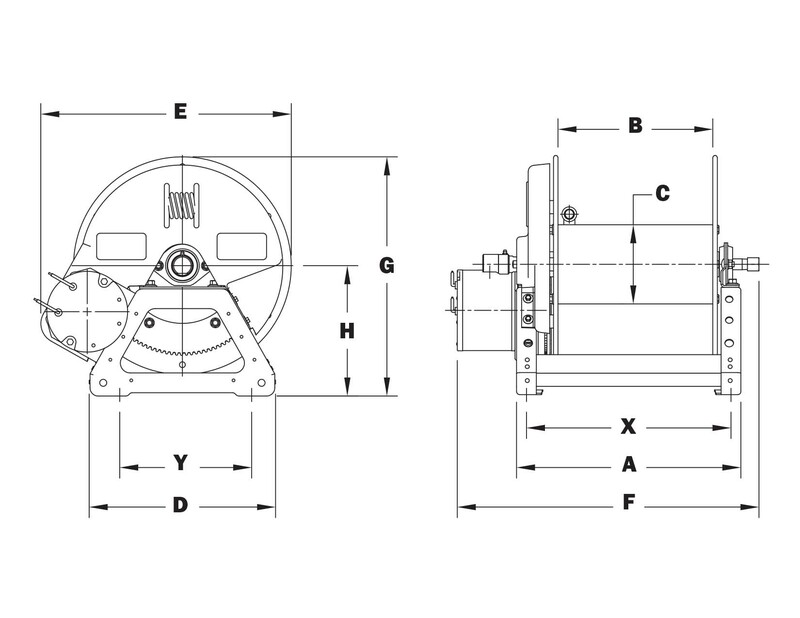 Dimension “F” is the overall length of standard model reels. Electric rewind reels indicated with ‘E’ in model suffix (example - SNC-12E). Note: A flexible connector must be used between the inlet pipe and the inlet swivel joint. To request a quote, simply complete the form below. It will then be quickly relayed to the person best able to assist you.